Sometime in the middle of 2012, a friend of Neil Prakash asked the young Australian if he was religious. "I'm a Buddhist," said Prakash, "but I believe there is a god, a deity". "You are not a Buddhist then," replied the friend, "you are confused". The simple exchange marked the beginning of a journey, literal and spiritual, that took Prakash from his home town of Melbourne to the heartland of the so-called Islamic State. 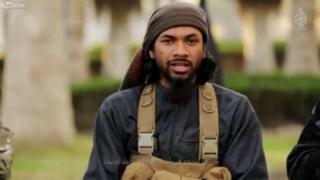 Neil Prakash, Buddhist and sometime wannabe rapper, became Abu Khaled al-Cambodi, dedicated jihadist and top IS recruiter. Now, in the latest twist in that journey, Prakash is reportedly in custody - and back from the dead. In May 2015, US officials announced that he had been killed in an air strike in the Iraqi city of Mosul, but according to a report in the New York Times he was arrested recently in an unidentified Middle Eastern country. Australian media reports say that Prakash handed himself in to Turkish authorities several weeks ago. Born in Australia to a Fijian father and Cambodian mother, Prakash travelled to Cambodia for the first time in 2012, at the age of 20. It was a confusing trip for a young man already uncertain in his faith. What he saw of Buddhism in Cambodia "didn't make any sense", he said later, in a slick IS recruitment video. Prakash returned to Australia, tempted to convert to Islam but knowing little about the religion. He began spending time with a group of Muslim friends and learning about Islam. He decided he wanted to recite the Shahada - a pledge of faith in Allah. He made the pledge at a local leisure centre used for Friday prayers. It was, he said in the IS video, "one of the best feelings I had in my life". The trip resulted in a chance meeting with Harun Mehicevic, an alleged extremist from Bosnia who had settled in Melbourne. Is the Islamic State finished? Prakash began spending time at Melbourne's Al Furqan Islamic Centre and bookshop, where he was radicalised by Mehicevic and others, but for more than a year after his conversion he did not substantially change his way of life. He grew frustrated and ashamed. "I thought to myself, what am I doing? I have a job, I have an income, a car, a house, what sacrifice have I made? What have I done for the sake of Allah? All those nights I slept in comfort, I thought about the people overseas in the Muslim lands that are suffering." So Prakash began to dedicate himself unsparingly to Islam. He sold his possessions and prepared to undertake the Hijrah - a journey overseas for the cause of Islam. In 2013, he travelled via Malaysia to Raqqa in Syria, the de-facto capital of IS and, in his own words, "the land of jihad". Once in Syria, Prakash was invited by an IS fighter to "come to Dawlah", forcing the young convert to confess he did not know the Arabic name for the group. "I was thinking 'Dawlah? What's Dawlah?' ... I only knew the English name, Islamic State." But IS brought him into the fold. "There are a lot of brothers from Australia that want to meet you," the fighter said. Prakash has since been linked to several terror plots on his home soil, including a knife attack against two policemen by 18-year-old Numan Haider, who was shot dead, and a foiled plan to attack police on Anzac Day, Australia's war memorial day. In April 2015, a 12-minute IS propaganda video surfaced in which Prakash praises Haider for carrying out an attack. He also tells the story of his conversion and, with increasing fervour, calls on others to follow him. "If anyone was to tell me three years ago I would be living under Sharia, among Muslims, I would tell them they were crazy," he says. "But look at the mercy of Allah, look what he has planned for me, and he can plan this for you too. All you have to do is believe!" Announcing Prakash's death last year, Australian attorney general George Brandis called the IS fighter the "most dangerous Australian" and said the country should be "gladdened" by the news, but he warned against complacency. In hindsight, his statement was both premature and prophetic. Michael Keenan, an Australian counter-terror official, said the government could not comment on the reports that Prakash was alive. "The government reported Prakash's death in May on the basis of advice from the US government that he had been killed in an air strike," he said in a statement. "But as we have said previously, the government's capacity to confirm reports of deaths in either Syria or Iraq is limited. These places are war zones, with many ungoverned spaces."